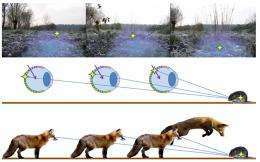 (PhysOrg.com) -- Scientists in the Czech Republic and Germany studying the hunting behavior of red foxes have discovered the foxes are more successful if they jump on their prey towards the north. Professor Hynek Burda of the University of Duisburg-Essen in Germany, and colleagues in the Czech Republic, studied the red fox (Vulpes vulpes), which hunts small prey in long vegetation or under snow by slowly creeping forward and listening intently before jumping high and pouncing on the prey from above, a process known as mousing. A total of 84 wild red foxes were observed in 65 locations in the Czech Republic by 23 wildlife biologists and hunters between April 2008 and September 2010. The observers used a compass to measure body orientation of the foxes as they prepared to make hunting jumps on 592 occasions in total, with the immediate success or failure of 200 of the jumps being clear. The observations were made in different seasons and habitats and different times of day. The researchers found that the foxes tended to prepare for their jumps in long vegetation or snow with their body aligned in a roughly north-easterly direction (around 20° clockwise from magnetic north). In short vegetation, where the foxes were more likely to be able to see their prey, there was no bias towards any particular direction. In long vegetation and snow 72.5 % of successful attacks were made when the foxs head was facing towards the north (340°-40°) and attacks from other directions were mostly unsuccessful, except for a successful cluster 15% at due south. These results were found regardless of the time of year, time of day, cloud cover, wind direction, or age and gender of the fox. The researchers say their findings suggest the successful attacks were enhanced by magnetic alignment, and Burda said their favorite hypothesis is that the fox uses information on the Earths magnetic field as a range finder. Burda said the fox could sense the magnetic northerly direction as a patch of dark or light. In the northern hemisphere the magnetic field tilts downwards below the horizontal at an angle of 60-70°, so the fox edges forward in search of the point at which the angle of the sound from the prey meets the slope of the magnetic field. At that point the prey is a fixed jump distance away. If the hypothesis is correct, the red fox would be the first animal ever shown to use magnetic fields as an aid to hunting, and the first to be shown to use it as an aid to estimating distance rather than direction. Many other animals are known to be able to detect magnetic fields, and in Burdas earlier work in 2008, herds of cows and deer were shown to align in a north-south direction, except when grazing under high-voltage power lines, which produce strong magnetic fields. The paper was published in Biology Letters and is available online. You are standing at a latitude of 50°N on a planet which rotates in orbit so that its star appears to move across the sky from east to west. The maximum attitude of the star above the southerly horizon in the course of this passage ranges from approximately 17° in the winter to 63° in the summer. You are searching for an example of a small native animal, longer than he is broad or tall. This specimen will be partially concealed by tall vegetation, breaking up its profile. Fortunately, its surface has a distinctly different colour than that of the surrounding brush; thus, it can be spotted if it is well illuminated, and the contrast effects of the light source are not too high. When you spot him, which direction will he most likely be facing? So, hang a magnet in the fox's collar, and see what happens. I don't think we should jump to conclusions yet. Fighter pilots often attack with the sun at their backs --- I mean along magnetic lines of force. gwrede has the right idea, perform a test with an artificial magnetic field and see if the behaviour changes. "These results were found regardless of the time of year, time of day, cloud cover, wind direction, or age and gender of the fox." Plenty of red foxes in Australia- so that might be the next spot to do some research.